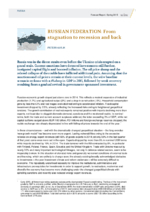 Russia was in the direst straits even before the Ukraine crisis erupted on a grand scale. Current sanctions have deterred investments still further, instigated capital flight and boosted inflation. The oil price slump and the related collapse of the rouble have inflicted additional pain. Assuming that the sanctions and oil prices remain at their current levels, the wiiw baseline scenario reckons with a 4% drop in GDP in 2015, followed by weak recovery resulting from a gradual revival in government-sponsored investment.